Skunks can be beneficial in some circumstances. After all, they eat mice and voles, slugs and reptiles that could harm your lawn, garden or home. On the other hand, they also devour nestling birds, berries, fruits and all kinds of landscaping. They are scavengers, and so they can and do eat almost anything they find. Then, there is the…smell. Now, to be fair, they can’t help it and it is a pretty effective defense mechanism. Still, it is another reason that discovering a family of skunks in residence in your backyard or garden is not always a desirable event. And though you might live in an urban area, it is entirely possible that everything from deer and opossums to skunks, squirrels and raccoons will make an appearance. So, if you would prefer to do your nature watching out in nature and not the backyard, you can take these steps to deter the adorably stinky fellows from choosing your home as an urban, suburban or rural habitat. End the Gravy Train – What are the skunks eating when they come to your yard or property? Chances are you can figure out why they think of your property as a good food source. It could be that vegetation or even a compost pile is the culprit. It could be that your bird feeders are a handy spot to grab a meal. Take the time to figure out what they are eating, and then do all you can to cut off the supply. Lock Down the Garbage – If you haven’t figured out what they are eating, chances are it is your garbage. That means relocating garbage cans to a place where they can’t reach them. Inside a shed or garage is best. If it is a compost bin, start to use an enclosed system or even a large drum with a lid until the problem ends. Uncover Hidey Holes – Skunks take shelter in spots like the dark and secluded areas beneath porches and decks, log piles, and beneath bushes or low growing plants. You need to either block entry to the hiding spaces (ensuring there are no young trapped inside) or open them up to sunlight and exposure. Brighten Up – Skunks dislike bright lights after dark, and are mostly nocturnal. Try to have timed lights on until later in the evening or use motion sensor lights that flood the yard each time a skunk or other critter makes an appearance. You may need a specialist to position the sensors properly since you don’t want the lights on when wind moves tree branches and so on. Motion sensing sprinkler heads might also be a good alternative, dousing them with water when they enter the property. 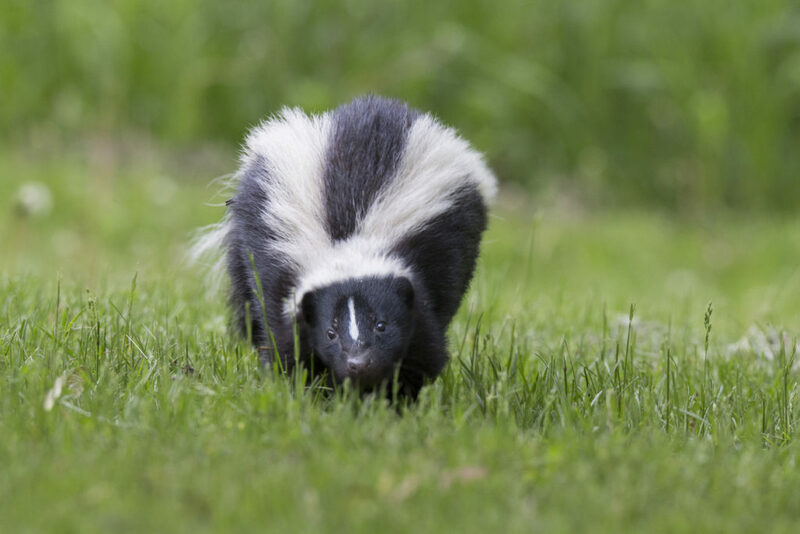 Stink THEM Out – There are scents that skunks dislike, including dog and fox urine, pepper sprays, ammonia and even citrus peels. You can use one or more of them to deter skunks. You can also skip all of the DIY options and cut right to the chase by calling the team at SWAT Wildlife. They can humanely capture and remove skunks from your property, ensuring they are unlikely to return by figuring out why the appeared in the first place, and removing future temptations.